Minutes of Union Masonic Lodge No 23 Special Bicentenary Communication in Grand Lodge Room, Grand Lodge, 17 Molesworth Street, Dublin on Saturday 30th May 2009 at 3.00 p.m. The Lodge opened on Form on the First or E. A. Degree of Freemasonry. Provincial Assistant Grand Master Right Worshipful Brother John Clarke was admitted and presented to the steps of the Dias where the Worshipful Master Wor. Bro Derek Sneddon extended a very warm and hearty greeting and tendered the maul and asked the Provincial Assistant Grand Master to take the chair and conduct the Business. Rt W. Bro. Clarke thanked the W.M. for his welcome but declined to take the chair on this very special occasion and said that he would not, on this occasion deprive the W.M. of the pleasure of sitting in that chair. He said he would be happy to take a seat beside him but if invited to visit Lodge 23 he may gladly take the Chair in our Lodge Room in Newry. R.W.Bro. 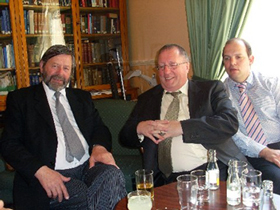 John Clarke with W.Bros. Derek Stevenson and Robert McCready relax before the bicentenary communication. The W.M. called on the Brethren to assist him in saluting the Provincial Assistant Grand Master which they did and after which the P.A.G.M. thanked the Brethren for their warm welcome and salute. The W.M. then called on the Brethren to assist him in saluting the Grand Lodge and Provincial Grand Lodge Officers. Having been saluted the Grand Lodge and Provincial Grand Lodge Officers suitably replied. Bereavement: Bro Robert John (Bobby) Hoy passed away on Thursday 28th May 2009. Bobby was proposed for membership on 20/1/69 and received his first degree on 15th September 1969; 2nd on 20th October the same year and his 3rd on 8th April 1970. Bobby had been ill for some time. A letter applying for the grant was posted and Sympathy Card is in hand. W.Bro. Jim Brown did not feel well enough to come here today which is a shame as he was W.M. 50 years ago and we had hoped to present him with his 60 year Certificate and Bar. W.Bro. Wilfie Lutton is another of today’s casualties as his ankle is badly swollen and giving him trouble. He did, however, say that he would attend the funeral of Bro. Hoy. The Secretary asked all brethren to make sure they sign (legibly) one of the 2 sheets available as this would be the only record of attendance here today. Written apology was read from Very Worshipful Brother Ron Legg, Provincial Junior Grand Deacon in the Province of Victoria, Australia and Secretary of The Clifton Hill Masonic Lodge No 90. Verbal apologies were recorded from Worshipful Brothers Jim Brown & Wilfie Lutton. Bro. 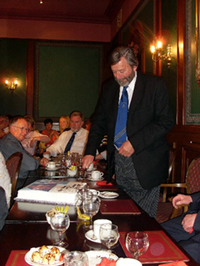 Paul Ferguson read the Minutes of 17th May 1909 (Centenary Year) and the Secretary read the Minutes of 18th May 1959. The Secretary also read a Brief History of Lodge 23 pointing out that while Lodges 18 and 23 originally had been 933 and split they seem to have remained linked over the past 200 years. Presentation: The Worshipful Master then presented the Provincial Assistant Grand Master with one of our Bicentenary ties upon which the P.A.G.M. said that if invited to Lodge 23 he would certainly wear this tie again. V.W. Bro. Cecil Auld congratulated W. M. and Lodge 23. Round of applause for W. Bro. Don Revels. W.M. spoke glowingly about the Secretary’s work. Fraternal Greetings were received from Lodges: 316, 83, 144, 77, 231, 350 & 630, 334, 173 and 835 Saintfield. The W.M. called on the brethren of Lodge 23 to assist him in saluting our visiting brethren who suitably replied. There being no further business the Lodge closed in Peace, Love and Harmony with the Junior Warden extending a hearty invitation to all to join the Worshipful Master in Newry Masonic Hall. This invitation was especially extended to all our visiting brethren. Move mouse over image to increase size.